Find out more about our horses! 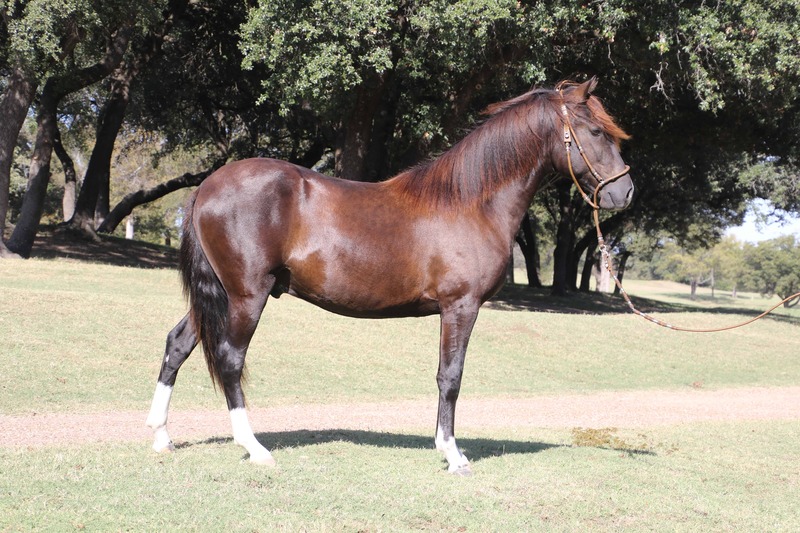 Featured here are some of our current & upcoming show & breeding stock! PVR Bailarina+ is our show stopping, beautiful bay mare! 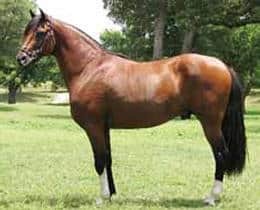 She has been many times Champion of Champions Breeding Mare, Best Bozal Horse of Show and won the prestigious Medallon de Plata award both as a Filly in 2015 and was the 2016 Medallon de Plata Mare. She also achieved her Medallon de Oro & Medallon de Diamante status in 2016. PVR Miss Diva is a beautiful chestnut mare. 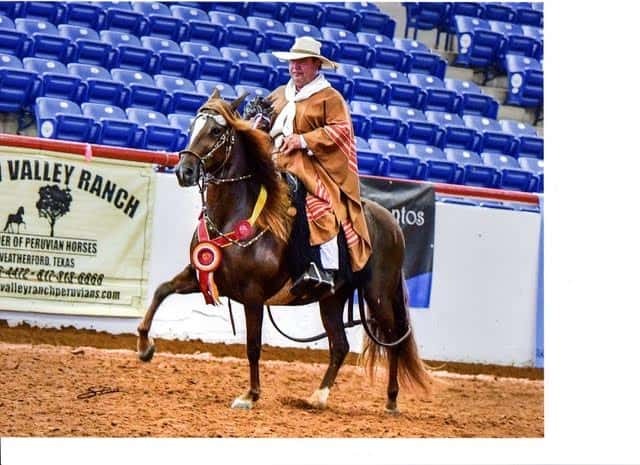 She has done amazing in the show ring, being the 2018 US National Champion Amateur Performance Mare, the 2018 US National Champion Performance Mare, and the 2017 US National Reserve Champion Performance Mare. She has had an exceptional filly with MLM Zeus, and we are looking forward to another foal in 2019 from her. Miss Diva is following in the footsteps of her US National Champion Breeding Mare dam. MLM Zeus is an exciting young stallion just starting his show and breeding career. We have several foals from him born in 2017 & 2018, and he is passing on his incredible pisos & wonderful temperament. 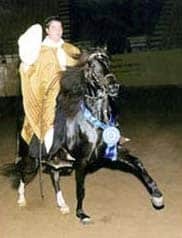 MLM Zeus has done well this year in very competitive shows, winning Champion breeding Stallion & Best Gaited. Learn more about some of the horses that have shaped our current breeding program. Fenix – the legendary bird who rose from the ashes. Or, in this case, the incredible brown stallion – full brother to a champion filly who died unexpectedly at age four. The story starts there – with the beautiful Madrilena – a daughter of *Rey de la Solana (*Laurel x *Surena) and *Mariangola (Carnival x *Faraona.) Born in 1975, she was a star even as a foal -winning many classes. Then, tragically, she died on April 26, 1979 after foaling. A few days later on May 8th, her full brother was born – a strong, handsome and energetic brown colt – the epitome of a definitely masculine model of his sister. It seemed fitting to name him Fenix. It was also fitting that he followed in his sister’s successful show career – in fact, exceeding it by winning many championships and pisos titles. 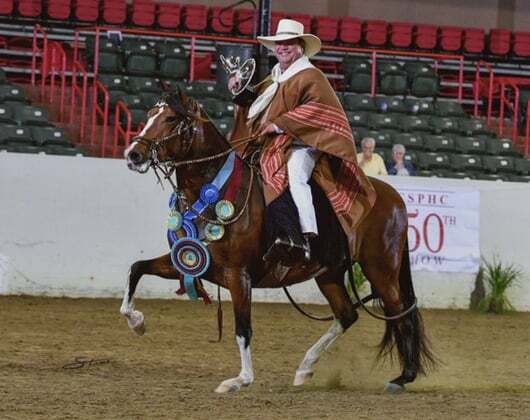 He became one of the first stallions in the Peruvian breed to be syndicated. And that, too, was fitting. Even though he had a stellar show career, his greatest impact on the breed was as a sire. Fenix touched everyone who met him. He was what cowboys call “an honest horse” – strong, good tempered, willing, just, proud and full of energy. But he was also an incredibly good Peruvian Horse – with plenty of brio, excellent conformation and superb pisos. These are the traits he passed on to his 237 direct sons and daughters – and 477 descendants! On February 18, Fenix was euthanized due to a colic impaction. At 28 years old, he was sound and otherwise healthy. His best friends for the last 18 years, Lucho and Jeanelle Dapelo, made the difficult decision not to put him through any more pain or surgery. He is buried on the farm beneath the pecan tress with a marker so that he will never be forgotten. Anyone who knew him or knows him through his offspring knows Fenix will never be forgotten. PPHRNA Lifetime Award of Medallon De Oro. 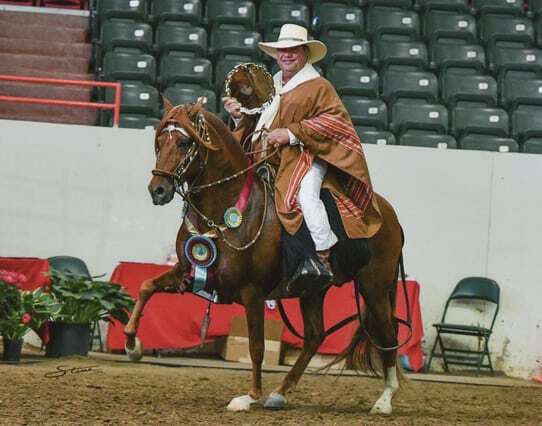 2002 National Laureada Performance Mare. Multiple Champion of Champions Performance & Breeding Mare. *ARC Anibal is an imported grandson of *AV Sol de Paijan. He is a very impressive black stallion and is proven in Peru. 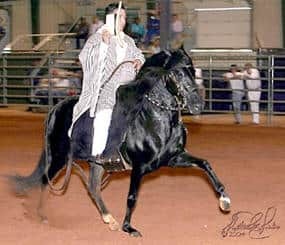 His exquisite gait with correction and strength is present in the Paso Llano with rhythm and harmony. His cadence and balance are carried over to the Sobreandando. Anibal had true Brio. He was a very gentle, sweet and noble horse with a very calm nature. Anibal produced many champions for us.